When it comes to Windows machines for the enterprise market, Lenovo’s line of ThinkPad laptops and ultrabooks are proven contenders. They have a fine reputation that’s made them a top choice for IT professionals looking for minimal headaches. 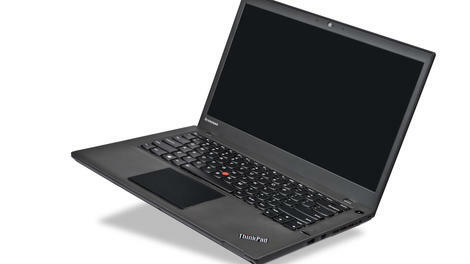 They also have a distinct look, one that’s changing with the new ThinkPad T431. This new ultrabook has a sleek, minimalist face that has as much in common with a MacBook Pro as it does with the previous ThinkPad T430. The speaker grills, volume rocker and even those red ThinkPad mouse buttons have been done away with. The result is a ThinkPad that has look like a granite slate, but it’s the insides, and the price, that will determine if it deserves to be called a ThinkPad. Old school fans might fret the new look, but this is a ThinkPad through and through. There’s a choice of Windows 8 or 7, up to a terabyte of storage, plus enterprise-oriented niceties like a fingerprint reader. Plus, retains the most iconic visuals of a ThinkPad, thanks to that red dot in the middle of the keyboard, the TrackPoint mouse, and a signature matte black finish. Before we sat down in front of a new ThinkPad T431, the word cluttered was never something we associated with the brand. But after seeing the T431 next to its predecessor, the T430, it was easy to notice how much visual noise had been stripped out. 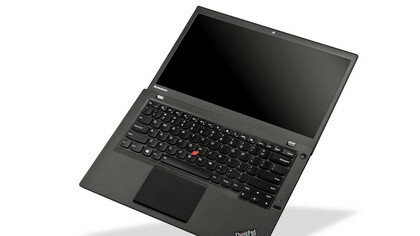 Lenovo’s new design direction with the ThinkPad is based on extensive user research. The company has gone to great lengths to see how costumers use its products, often in less than ideal situations. For example, the T series has been able to sit at a 90-degree angle since Lenovo observed a tester sitting on the floor of a crowded Chinese café with his ultrabook flat against his knees. Now, a newly recessed hinge design makes it even easier to work at such awkward angles. Even if you’re able to get a seat everywhere you work, you’ll appreciate the beefy hinges Lenovo has applied to the T431. Also, the so-called "sweater-catchers," hooks that keep the machine closed and have a tendency to grab cloth, have been removed. For those who know their ThinkPads, the most striking tweak will be touchpad. Gone are the dual sets of click buttons; you can now press directly on the touchpad to click, and we’re pleased to report it springs back with the same elasticity as the space bar. The change may worry ThinkPad fans, but make no mistake, this layout made it just as viable to use the trackpoint and click with the touchpad as it has been on previous ThinkPad models. We know this has been a choice fans of the brand appreciate, and it remains in tact here. It’s also the same design that’s been applied to the upcoming convertible, the ThinkPad Helix, so fans ought to warm up to it. 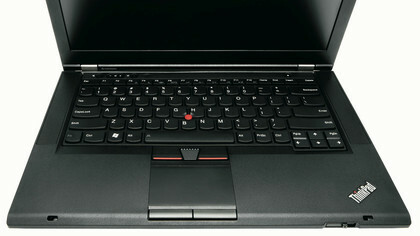 We love the ThinkPad line for their keyboards, and were glad to have our expectations met here. While we didn’t get to see it in action, we we’ve been told that the keys on the T431 are backlit in that signature ThinkPad red. So the aesthetics are there, and so are the internals. As we mention, T431 users can choose up to 1TB of storage, and pick an Intel i5 or i7 at 3.30GHz. For memory there’s room for as much as 12GB. 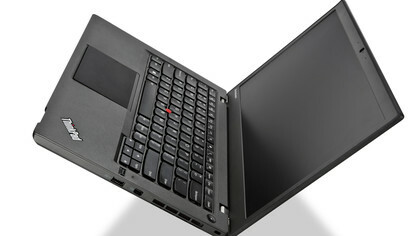 If you’re looking at a ThinkPad, chances are you’re a frequent work traveler and telecommuter. 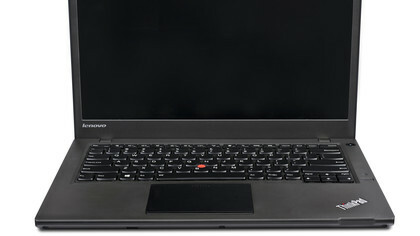 At 3.6 lbs (1.63 kg), the T431 tips the scales a bit for an ultrabook, but that size accommodates a lot of nice features. In addition to a choice of high-end specs, a 720P webcam will make you the highest resolution talking head in your next teleconference. As far as overall build goes, the T series has lost a few millimeters. 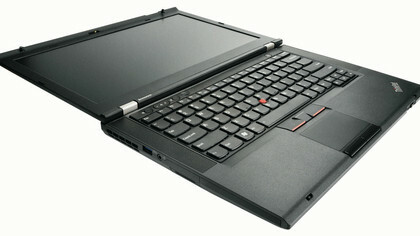 It’s slimmed down from the T430, measuring 13.03" x 8.89" x 0.80" (331 mm x 226 mm x 20.6 mm). Basically, it’s looking good. While the ThinkPad has long been a go to brand for the IT professionals who choose the machines their co-workers will be carrying, this design refresh seems oriented toward getting the average user to turn his head. It’s also interesting to note the lack of touchscreen, and the choice to stick with Windows 7 rather than 8. Like a lot of the PC world, Lenovo doesn’t seem quite ready to fully embrace Microsoft’s new OS, and they’ve likely earned a lower price point for their machine by doing so. We didn’t get a firm word on pricing, but if anything like past models, builds could start in the $700 range. 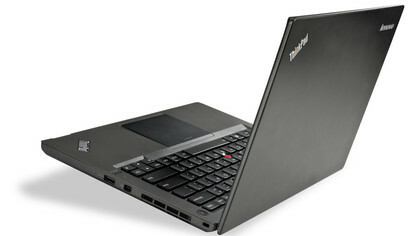 As far as we’re concerned, anything Lenovo does to make the ThinkPad look sleeker is just gravy. It’s a balance of performance and portability at a reasonable price point that make a ThinkPad, but the visual refresh is appreciated. So far the T431 fits the bill, and we look forward to getting this ultrabook in for a full review.